she*had*a*thirst*for*knowledge | where did you get that penchant for destruction in the way that you talk? 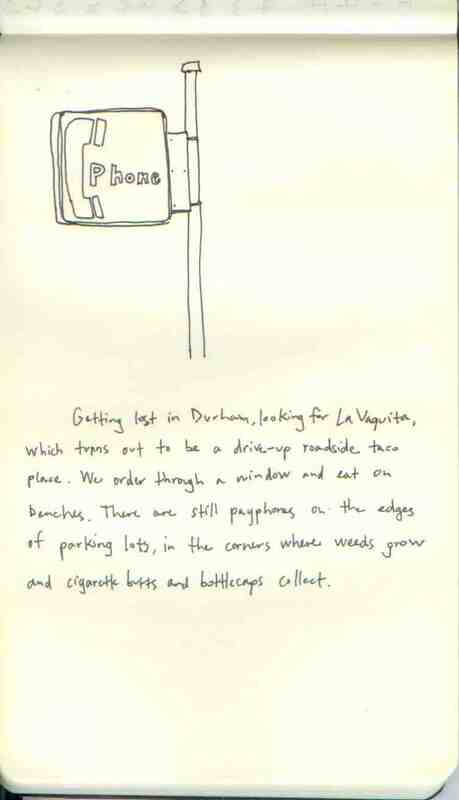 Getting lost in Durham, looking for La Vaquita, which turns out to be a drive-up roadside taco place. We order through a window and eat on benches. There are still payphones on the edges of parking lots, in the corners where weeds grow and cigarette butts and bottlecaps collect. I was with my mother in downtown San Diego. We were always riding buses back then, to the hospital for Mom’s prenatal visits, and to visit Jim. It was rainy. That was unusual, and the streets were gray and shiny. A florist at his stall handed me a Boston fern frond. He showed me the underside, the tiny raised bumps of seeds. I ran my fingers over the bumps and smiled. My mom let me push the button for the pedestrian signal at the crosswalk. I pushed it 3 times. But then I couldn’t remember if I’d really pushed it 3 times. What if I’d really pushed it 4 times? Then the light would never change. You have to push the button an odd number of times to make it change. So I pushed the button again, just in case. A panic set over me then. What if I had really pushed the button 3 times, and by pressing the button again just in case like I had, what if I had messed it up? So I pushed the button again. I was paralyzed. I was terrified that the pedestrian signal wouldn’t come on, and it would be my fault. The forward motion of my mom as she moved to cross the street pulled my hand that was in hers. The light had changed. I hadn’t broken it. I rubbed the undersides of the leaves on the fern frond, the tip of my finger tracing the lines of the fern seeds. We crossed the road.